Before purchasing diamond jewellery, it is important that you have some understanding about the stone that you are taking home. That being said, there are many people that don’t know much about diamonds, and this can absolutely affect their final choice. For instance, many people may purchase a diamond because it is the biggest, whereas in reality this might have not been the best option. To help you in your diamond endeavours, our team of Adelaide diamond specialists have come together to give you a valuable lesson in these gorgeous stones. Welcome, to Diamond 101. The first thing you need to know about diamonds is the colour. The GIA Colour Grading Scale is the most widely accepted grading system, though it’s not the only one. Ranging from D to Z, D colour represents a pure and colourless diamond. As you progress through the scale towards Z, the diamond becomes less and less pure, the colour turning more yellow in nature due to it’s imperfections. D - F grade diamonds are classed as colourless, G - J near colourless, K - M faint, and so on. While the difference between a D and a G may be very small to the untrained eye, it has a huge effect on the price of the piece. Gerard McCabe Aura engagement ring, colour F.
Determining the clarity of a diamond involves a great many things, the process including the number, size, nature and position of imperfections. The imperfections are known as ‘inclusions’, and they have a big effect on the overall look and price of the diamond. 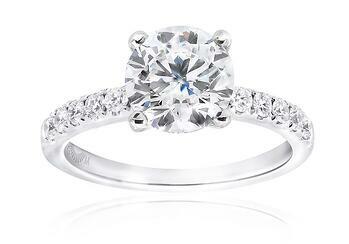 Naturally, the closer a diamond is to perfect, the higher the price. Diamonds can be flawless, Very, Very Slightly Included all the way to Included. Many of these inclusions are almost invisible to the naked eye, which is why expert assessment is of paramount importance. This aspect of assessing a diamond is renowned as the most technical and difficult to assess. 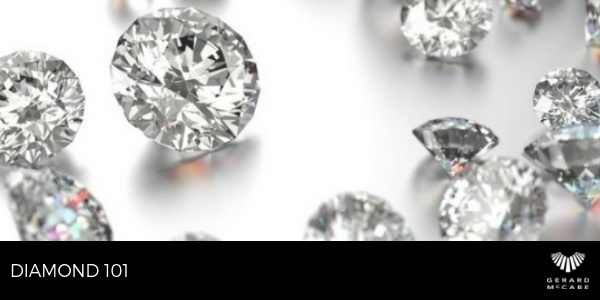 There are seven components outlined by the GIA Cut Grading system. The first three, consisting of brilliance, fire and scintillation, are in regards to the overall face-up appearance of the diamond. Brilliance: the light reflected from the diamond. Fire: the formation of the light into rainbows. Scintillation: the sparkle the diamond produces. The other four, weight ratio, durability, polish and symmetry, are for the diamond’s craftsmanship and design. 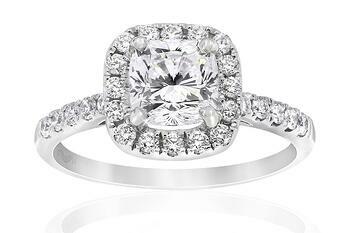 Gerard McCabe Aria engagement ring, brilliant cut centre diamond. More often than not, the price of the diamond will increase with the carat size. Carats are a measure of weight equal to 200 milligrammes, however, the overall price will be a result of the combination of the clarity, cut, colour and carat weight of the stone. With this information, you will be able to make a more informed decision when it comes to purchasing your ideal engagement ring. If you would like any assistance, or have any questions about how a diamond’s quality, and price, is measured, please feel free to contact our team of Adelaide engagement ring specialists today.